Published Tuesday, February 23, 2010, OK personal/derivative use; link www.lovethatimage.com. 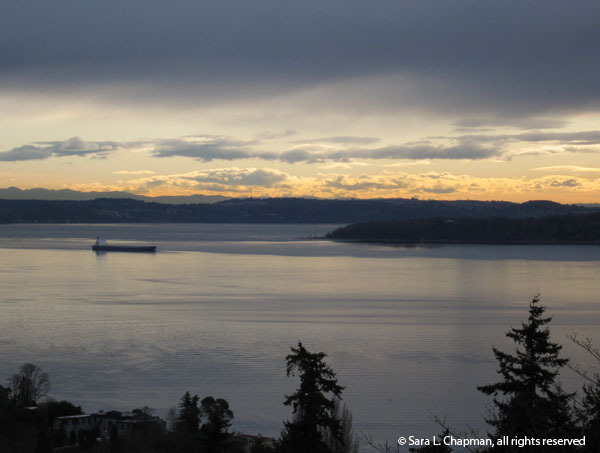 This overlook of Puget Sound near my house has been a photo op blessing whenever the clouds part a bit. I like the look of the late day light. You can just see the ripples on the water surface. Visit Watery Wednesday for more visions of water in all its forms. And for visual reflections, some subtle and some not, visit Weekend Reflections. Don’t forget to visit Scenic Sunday for more scenery of all kinds. peacefully beautiful. i love the muted tones here. Mine is up as well at aussiepomm! Very nice capture of light and very nice composition. This photo reflects the peaceful ambiance of the lake very well. I love the entire shot, especially the sky. I could stare at that view for ever…and ever. Such a serene shot . Very beautiful scene!!!! This is a great landscape!!! That is so gorgeous and serene I can see why it would be a favorite photo and even better place to see in person. What a serene scene. Looking at that, it’s hard to believe there are millions of people in the neighborhood, which makes your photo all the more remarkable. This photo is by far one of the best I’ve seen today while visiting other W W participants. Absolutely outstanding!! That looks like a lovely way to spend the day. Love the purples, greys and golds in this shot. That is really beautiful. I can practically imagine what it was like standing there watching the horizon. What a lovely view to have near your house. It must be like being on holidays all the time. So pretty and really nice lighting, nice shot!..I love the Puget Sound. You’re lucky this is your view! Good stuff! I could remain quite some time after taking the photograph! What a beautiful scene! Lovely soft landscape! Relaxing view! Definitely a great photo op! Love the subtle color orange against the graying sky. What a gorgeous view of the water! The colors are beeautiful, great photo! That looks like a very nice place to visit. Love the calm water. Such a beautiful scene. Lovely composition, and the light is perfect! I’ve seen this scene SO many times.. never tire of it!